Calgary to Rarotonga, Cook Islands - $702 CAD roundtrip including taxes | new record! 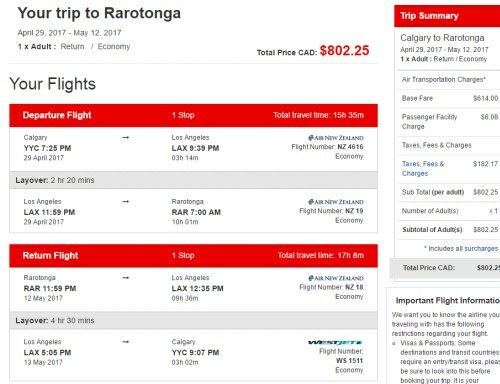 Air New Zealand has dropped the price of their flights from Calgary to Rarotonga, Cook Islands in the south Pacific down to $702 CAD roundtrip including taxes. This is over 50% below the typical bottom price from Calgary to the Cook Islands. Most will end up paying $1500-$1600 for this flight. You can take advantage of this sale in conjunction with a booking promotion from Flight Centre, to achieve a really amazing price. 1. Flight Centre is offering a promotion for $100 off of all international flights from Calgary, provided that the flight is a minimum of $750 CAD roundtrip. The Flight Centre promotion expires on November 30, 2016. However, the Air New Zealand Cyber Monday promo ends *tonight* at midnight PST, and the prices will return to normal. You should see flights from Calgary to Rarotonga for around $802 CAD roundtrip including taxes. You can still find the late Oct and Nov 2017 flights in their system though. I've provided some direct search links below. And if you call them, they should still be able to book the dates in late October and the first part of November and give the additional $100 discount. 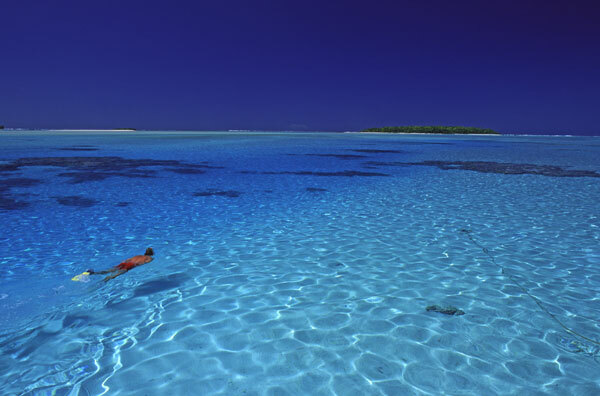 Calgary to Rarotonga, Cook Islands - $628 CAD roundtrip including taxes | new record! calgary, yyc, flight deals, air new zealand, pacific islands, rarotonga, cook islands, polynesia and australasia and oceania. 14 Responses to "Calgary to Rarotonga, Cook Islands - $702 CAD roundtrip including taxes | new record!" Depends on the dates chosen. I booked at 4:00PM tonight and got $853 ($753 after the Flight Centre discount). July 8 to July 21. Thanks YYC Deals!!!! It's still alive. (8:04 PM MST). It's been available all day. Certain dates are just no longer available (sold out). Got ours!! The return leg from LA is later (7pm) now, the 5pm flight went up in price but, STILL! This is why I'm on your mailing list! Bring on Rarotonga!! Have a great time in the Cook Islands Eimear! Booked earlier today. Great find! Love your work, keep it up! Thanks! Chris, thank you! We just booked (10pm) and got the $702 deal for September flights. Never been so spontaneous for any travel anywhere ever, but such a deal we couldn't resist! Wow, a lot of Calgarians seem to be heading to the Cook Islands! Deal is over! So disappointed! Unfortunately this one is over. It was a part of the Air New Zealand Cyber Monday sale. Thanks Chris! My wife and I have taken advantage of at least a half a dozen of the deals you've posted!! Including this one! Keep up the fantastic work! I feel like we owe you big time! Wow, 6 trips, that's great to hear Cody! I'm glad it's helped. Have fun in the Cook Islands! We booked with friends! So pumped!! Hopefully it comes up again- as some more friends want to join us!